Jeans are a timeless staple that will always stick around, no matter the season or era. However, there are always jean trends that come and go. Staying on trend with the latest styles can update your look, in a simple way! One of the easiest ways to “date” yourself is by wearing a pair jeans that are out of style. A simple way to stay "on trend" and "in style" is by updating your wardrobe with a pair of trendy jeans. Wearing these will bring style to any outfit you pair them with! This post is all about the latest trends in denim to be on the look out for. I really have never been a "jean" kind of girl. my personal style tends to be on the dressier side of the fashion spectrum. However, with all the new, fun styles of denim I have been more into jeans lately! This is a trend that is always coming and going. For a pair of jeans, this is definitely the comfiest route. If you want to make a statement with your jeans, this is the way to go! I love this look for Spring. These jeans style well with a casual look, or even a more dressed up look with wedges. I just purchased a pair of these recently, and they are by far my favorite! I like the uneven asymmetrical look of them. This hem is perfectly paired with a sandal, flats, or slides. The step hem is so on trend right now, and it doesn't seem to be going anywhere! This is the look of a higher raw hem in the front and a lower hem in the back. This hem adds a touch of flare and style to any look and works great for those on the petite side as well. The raw hem or the "cut off" hem is the biggest overarching trend in the denim world right now. 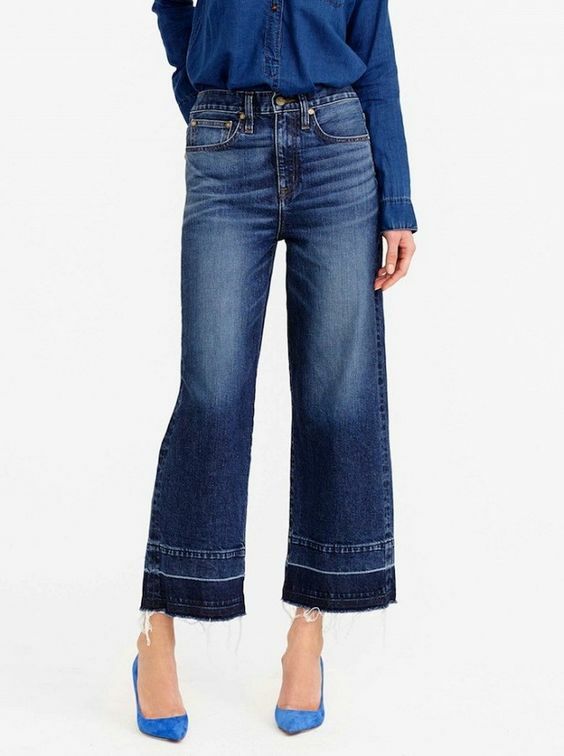 It's almost difficult to find jeans with a normal hem! I love the effortless look this creates, and another thing I love is that you can create this look for FREE with a simple snip of the scissors and an old pair of jeans! This hem is one in which the hem is at an angle that usually inclines intowards the leg. ANother simple way to add interest to a pair of jeans. These look great cropped with a pair of mules too! The patchwork look on denim has always been in and out of fashion. I think when it is done right, it can look totally on trend. The patchwork details adds style to the denim, while also adding a touch of fun! In this look, I went for a more bohemian relaxed look. This pair of frayed denim jeans sure make a statement, so the outfit is all about making them the focal point. The neutral top balances out the look, while the ruffled bell sleeves still add interest. When I saw these jeans at Francesca's, I fell in love! I was with my sister and mom at the time, and I think they thought I was crazy. Haha. At the time they weren't on sale, so naturally I decided to pass. One of my best deal finding strategies is just waiting! I knew they may or may not make it to the sale rack, but it was worth the shot. I came across them on sale almost 5 months later! You can imagine my excitement. Stalk those sale racks ladies! You never know what you'll find. Cropped Frayed Jeans - $20 Francesca's (bought during a buy one get one 50% off sale) Buy one HERE! Ruffle Sleeve Top - $16 Banana Republic (originally $49, bought on sale with an additional 50% off) Buy one similar HERE! A great pair of jeans is a necessary staple to any wardrobe. There is no better way to update your look this season then with a fresh new pair of jeans! For those looking to stay on trend and keep up with the latest fashions, purchasing any of these trendy pairs will be sure give you that fresh look you are after. So the next time you are out and about, keep an eye out for a great pair of stylish jeans to invest in this season!